DIE Martis, videlicet, 28 Junii. Message to the H. C. that the Lords agree to the Propositions about Galway, and the Amendments in the Scots Treaty. Committee to draw up a Petition to the King, to withdraw the Protection from Galway. Lord Mayor examined, about the Proclamation in the City, against bringing in Money, &c.
Lord Mayor not to publish any Thing, without acquainting the Parliament. To answer the contrary at his Peril. and to sit P. M.
Impeachment of the Nine Lords to be considered. Committee to receive the Weekly Accounts of Saddlers and Gunsmiths. Order for Capt. Moyer's Ship to stay at Hull, and Merchantships to be hired for bringing away the Magazine. Sir Tho. Cary versus Bishop of Ardagh. The Lord Wharton is appointed this Day to be Speaker. To let them (fn. 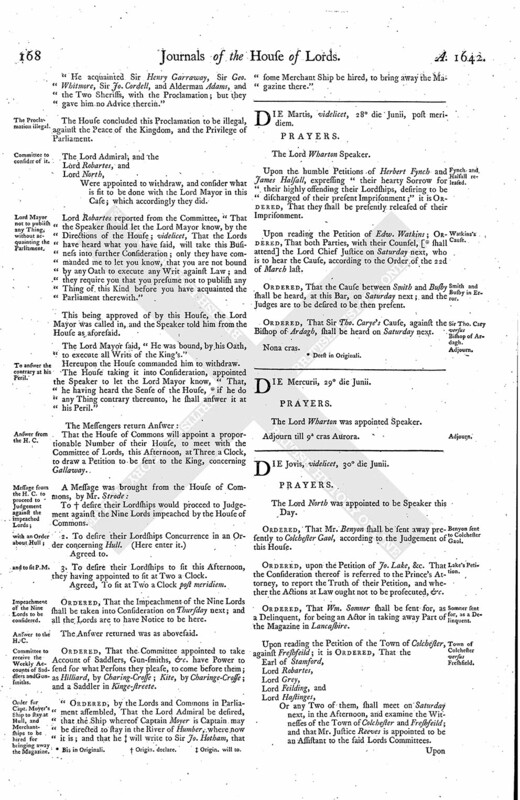 1) know, that the Lords do agree with them in the Propositions concerning the Town of Gallaway, and the Propositions concerning the Treaty with the Scotts; and that this House hath appointed Two Lords, to join with a proportionable Number of the House of Commons, to draw a Petition to the King, concerning the Town of Gallaway. Were Committees, to meet with a proportionable Number of the House of Commons, to draw the Petition to be sent to the King; and to meet this Afternoon, at Three a Clock. 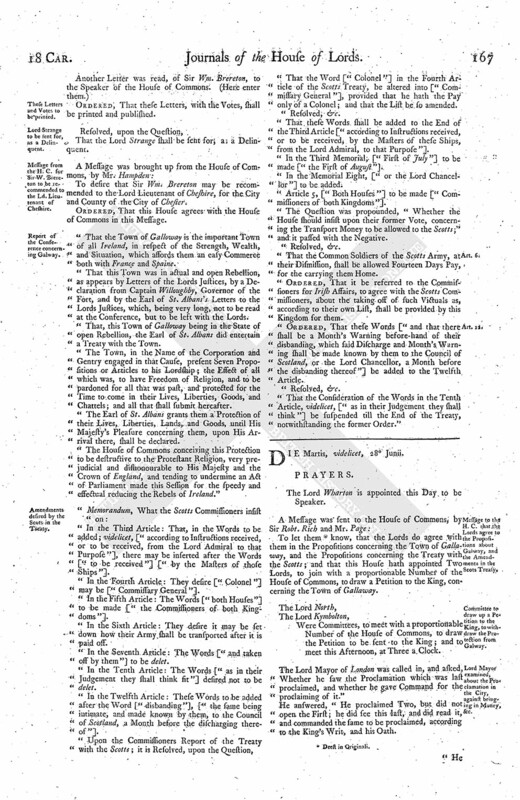 The Lord Mayor of London was called in, and asked, "Whether he saw the Proclamation which was last proclaimed, and whether he gave Command for the proclaiming of it." He answered, "He proclaimed Two, but did not open the First; he did see this last, and did read it, and commanded the same to be proclaimed, according to the King's Writ, and his Oath. "He acquainted Sir Henry Garraway, Sir Geo. Whitmore, Sir Jo. Cordell, and Alderman Adams, and the Two Sheriffs, with the Proclamation; but they gave him no Advice therein." The House concluded this Proclamation to be illegal, against the Peace of the Kingdom, and the Privilege of Parliament. Were appointed to withdraw, and consider what is fit to be done with the Lord Mayor in this Case; which accordingly they did. Lord Robartes reported from the Committee, "That the Speaker should let the Lord Mayor know, by the Directions of the House; videlicet, That the Lords have heard what you have said, will take this Business into further Consideration; only they have commanded me to let you know, that you are not bound by any Oath to execute any Writ against Law; and they require you that you presume not to publish any Thing of this Kind before you have acquainted the Parliament therewith." This being approved of by this House, the Lord Mayor was called in, and the Speaker told him from the House as aforesaid. The Lord Mayor said, "He was bound, by his Oath, to execute all Writs of the King's." Hereupon the House commanded him to withdraw. The House taking it into Consideration, appointed the Speaker to let the Lord Mayor know, "That, he having heard the Sense of the House, (fn. 2) if he do any Thing contrary thereunto, he shall answer it at his Peril." That the House of Commons will appoint a proportionable Number of their House, to meet with the Committee of Lords, this Afternoon, at Three a Clock, to draw a Petition to be sent to the King, concerning Gallaway. To (fn. 3) desire their Lordships would proceed to Judgement against the Nine Lords impeached by the House of Commons. 3. To desire their Lordships to sit this Afternoon, they having appointed to sit at Two a Clock. Agreed, To sit at Two a Clock post meridiem. Ordered, That the Impeachment of the Nine Lords shall be taken into Consideration on Thursday next; and all the Lords are to have Notice to be here. The Answer returned was as abovesaid. Ordered, That the Committee appointed to take Account of Saddlers, Gun-smiths, &c. have Power to send for what Persons they please, to come before them; as Hilliard, by Charing-Crosse; Kite, by Charinge-Crosse; and a Saddler in Kinge-streete. "Ordered, by the Lords and Commons in Parliament assembled, That the Lord Admiral be desired, that the Ship whereof Captain Moyer is Captain may be directed to stay in the River of Humber, where now it is; and that he (fn. 4) will write to Sir Jo. Hotham, that some Merchant Ship be hired, to bring away the Magazine there." Upon the humble Petitions of Herbert Fynch and James Halsall, expressing "their hearty Sorrow for their highly offending their Lordships, desiring to be discharged of their present Imprisonment;" it is Ordered, That they shall be presently released of their Imprisonment. Upon reading the Petition of Edw. Watkins; Ordered, That both Parties, with their Counsel, [ (fn. 5) shall attend] the Lord Chief Justice on Saturday next, who is to hear the Cause, according to the Order of the 22d of March last. Ordered, That the Cause between Smith and Busby shall be heard, at this Bar, on Saturday next; and the Judge are to be desired to be then present. Ordered, That Sir Tho. Carye's Cause, against the Bishop of Ardagh, shall be heard on Saturday next.